Truck accidents have the potential to be life-changing and life ending. 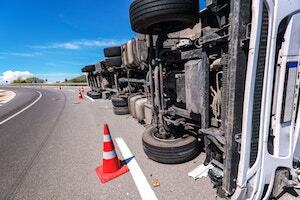 The best truck accident attorney knows that every area of investigation must be fully explored. One thing you can count on is that the trucking company will fully investigate the accident as well. But as an injured victim after a truck accident you cannot rely on the trucking company or corporation to provide you with evidence or help in any way. That is why you need to identify and hire the best truck accident lawyer in Florida that you can find. Your truck accident attorney should have experience in truck accident cases resulting in personal injury or wrongful death. The truck accident law firm that you choose must be fearless in going after all potentially responsible parties be they owner-operators or national/international corporations. The investigation of your truck accident in Miami or anywhere in Florida can include truck accident experts such as accident reconstruction, private investigators, human factors, medical, physics and possibly biomechanical. The Miami truck accident attorneys at the Wolfson Law Firm have represented truck accident injury victims and the families of those who were killed in truck accidents since 1963. They know what to do and they are ready to help you and your loved ones. Call us right now at 305-285-1115 or toll-free at 855-982-2067 for your free consultation. We would welcome the opportunity to discuss your truck accident and outline our investigation plan. the amount of time that each driver rests and drives each day. Generally, a truck driver can drive a maximum of 11 hours and then there required to rest for 10 hours. It is illegal for truck drivers to drive 60 hours or more over a seven-day cycle or greater than 70 hours in an 8-day period. Obtaining the logbook is only the beginning. The entries in the logbook must be compared and contrasted with other evidence to make a determination if there were any false or fraudulent entries in the logbook. Background investigations of owners, operators and drivers of commercial motor vehicles including trucks, tractor-trailers, commercial transport vehicles and 18 wheelers can often prove quite helpful in personal injury and wrongful death lawsuits. Again, the information obtained in the investigation of any truck accident is compared with the other evidence in the case. If there are conflicts, this can lead to additional avenues of investigation and discovery. Not only is the investigation following a semi truck accident complex, it is also time sensitive. It is important to place the trucking company on notice to preserve any and all evidence that might otherwise “disappear”. Therefore, finding the best truck accident attorney for your case and doing it quickly can really make a difference in the results that you ultimately obtain. At the Wolfson Law Firm, our Miami trucking accident lawyers provide complete legal representation to truck accident victims of South Florida from Hialeah, Medley, Port Everglades, Miami, Fort Lauderdale, Miami International Airport, Port of Miami, Miami Gardens, Sunrise, Homestead, Florida City, Key West, Key Largo, Orlando, Tampa, West Palm Beach, Jacksonville, Pembroke Pines and Miramar.